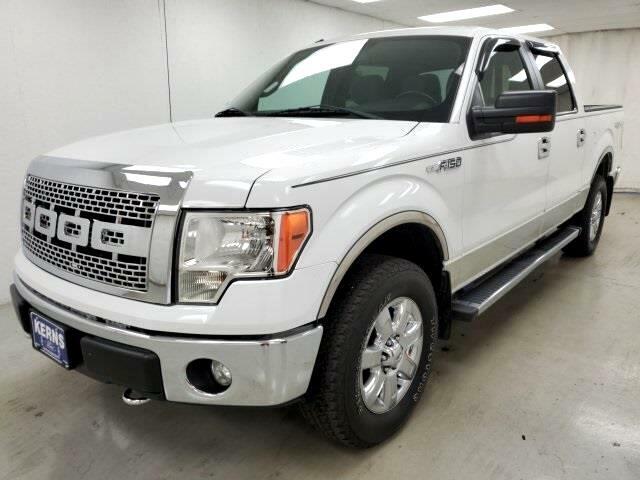 2012 FORD F150..SUPERCREW..XLT PACKAGE..LOADED..XLT PLUS PACKAGE..CHROME PACKAGE..REVERSE SENSING..POWER PEDALS..TRAILER TOW..TAILGATE STEP..POWER PEDALS..FULL POWER..115 POINT SERVICE COMPLETED..CALL.F-150 XLT, 4D SuperCrew, 4WD, Steel Gray w/Cloth 40/20/40 Front Seat, 18" Chrome-Clad Aluminum Wheels, 4.2" LCD Screen in Cluster, 5" Chrome Running Boards, 6-Way Power Driver Seat, ABS brakes, Chrome Door Handles w/Black Bezels, Chrome Exhaust Tip, Compass, Electronic Stability Control, Heated Power Side Mirrors, Illuminated entry, Leather-Wrapped Steering Wheel, Low tire pressure warning, Order Code 507A, Power Adjustable Pedals, Power Sliding Rear Window w/Defrost & Privacy Tint, Remote keyless entry, Self-Dimming Rear-View Mirror, SYNC, Traction control, XLT Chrome Package, XLT Convenience Package, XLT Plus Package. At Kerns Ford Lincoln & Truck Center, whether you've got great credit or bruised credit, we have the car / truck / SUV / van for you. We believe in Live Market Pricing to ensure our prices are very competitive and minimize the back and forth negotiations that most shoppers aren't big fans of. Give us an opportunity to earn your business -- you'll be glad you did!